Inflamed joints combined with pain can be debilitating. There are a number of reasons our bodies will act up, whether it be from your active lifestyle or simply a side effect of aging. 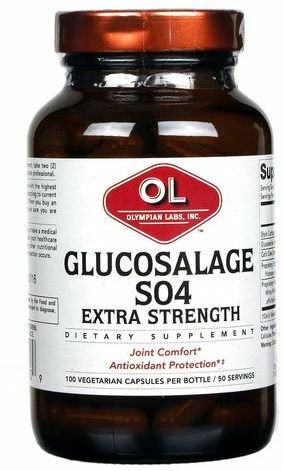 Olympian Labs Glucosalage Extra Strength powerful formula contains a unique combination of Shark Cartilage (a natural source of chondroitin sulfate), Glucosamine Sulfate, and Cats Claw, along with added enzymes to support healthy joints and aid in reducing inflammation, as well as herbs to help alieve pain. With constant joint movement our bodies are continuously replacing the cartilage in our joints to keep us moving. Studies suggest both Chondroitin and Glucosamine are beneficial to maintaining healthy joints. Chondroitin is a naturally occurring chemical, found in cartilage around joints in the body and is responsible for building and strengthening the ground substance of cartilage. Olympian Labs Glucosalage Extra Strength supplements your level of chondroitin sulfate with Shark Cartilage, to stimulate cells to help build joint cartilage. Glucosamine Sulfate is a naturally occurring chemical found throughout the human body, including in the fluids surrounding joints. Glucosamine Sulfate studies suggest it may inhibit the breakdown of cartilage and may have the potential to help build-up cartilage. Recurrent inflammation is a primary cause of many joint related ailments. The enzymes in Olympian Labs Glucosalage Extra Strength aid in breaking down the proteins in the blood that cause inflammation as well as clearing up excess water in the area of inflammation. While these supplements are helping your joints, Cats Claw has been included to give your body additional antioxidant support for added joint and cell protection to help keep cells from being damaged by free radicals. Contains: ingredients derived from shellfish (crab, shrimp, crayfish), and fish (shark).